There's going to be a lot of clean up when all this is over. I picked up all my blue-and-white plates secondhand. 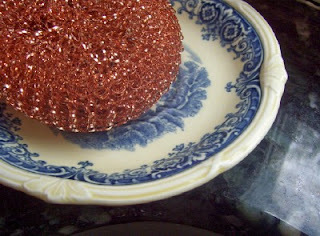 PS--I enjoyed Sandy's post on dish swapping with a friend and other low-cost valentine ideas. I do hope those pretty dishes can go in the dishwasher and not have to be washed by hand since I am sure you have your hands full now and will for the next few days. Has Andrew's party been rescheduled? Stay warm and cozy and feel better! I do hope you are all feeling much better soon! We have had a long season of illness and are happily on the mend! The clean up can wait - rest and take care of yourself! Yikes I dont think Id put those in the dishwasher! Love those dishes! 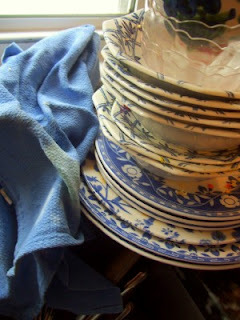 Love the blue and white...I ahve th blue and white theme going with my dishes lately as well..and like you I buy most second hand.....it's fun. Knowing that you have all been sick, I was a little worried about reading a post with the title, "Scenes from the kitchen sink." But, it's just blue and white plates...very pretty. Love your dishes! Our everyday dishes are all blue and white transferware. I put them in the dishwasher and it hasn't hurt them yet. None of them are inherited family heirlooms, though. Your dishes remind me of my grandmother's. I loved my grandmother's dishes. :) Unfortunately, my kitchen decor would clash with blue and white.